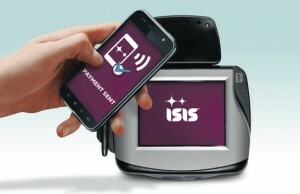 ISIS has announced that its long awaited mobile wallet — an initiative backed by AT&T, T-Mobile and Verizon Wireless — will begin its trials in Austin, Texas and Salt Lake City. Accompanying the launch is a suite of nine ISIS ready handsets that are available for purchase at AT&T, T-Mobile and Verizon Wireless stores. The company expects as many as 11 additional ISIS Ready handsets to be available by the end of this year, giving customers many choices. Load an eligible American Express, Capital One or Chase credit card into the Isis Mobile Wallet or use the Isis Cash card included with every Wallet. Consumers are then ready to make payments at hundreds of locations across Austin and Salt Lake City where contactless payments are accepted. A full list of locations can be found on the ISIS web site. ISIS’ open model enables customers to choose which card and account of with which to make payments— a concept that is vital to credit giants Visa and MasterCard. The launch of the ISIS Mobile Wallet is a significant step in the direction of a new payment landscape that could see enhanced convenience and a better overall shopping experience for consumers.